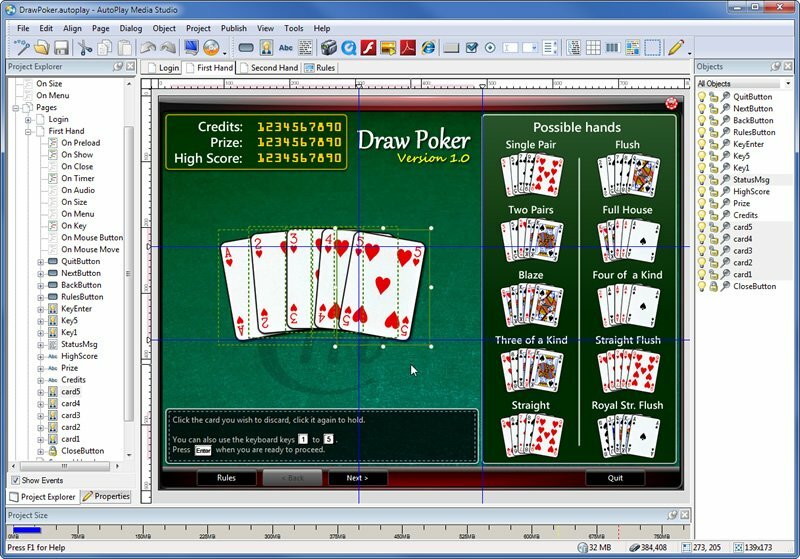 AutoPlay Media Studio 8 is a software development tool that gives software developers and programmers the ability to create full-featured interactive Windows multimedia software applications using a visual drag-and-drop development environment. What would take weeks to build using traditional software development tools (C, C++, Java, Visual Basic, Delphi) can now be created rapidly by anyone. Use it to create database and internet applications, autorun cd/dvd/usb/blu-ray interfaces, multimedia software and much more.AutoPlay Media Studio's visual rapid application development environment makes software programming faster and eases the software development process. Build multimedia software, business software and application software for use on Windows 7, Vista and XP. Drag and drop technology reduces your software testing and software prototyping burden and increases software quality. Agile software development is easier with AutoPlay Studio's rapid application development environment!Simply drop your videos, images, Flash, HTML, music, text and document files onto Autoplay Media Studio's pages and dialogs and move them into position using your mouse. Once you've created the visual interface, adding in powerful interactivity is a snap. With the Action Wizard, all it takes is a few clicks and a fill-in-the-blanks form. With over 865 high-level actions to choose from, like XML parsing, sending email, running applications, downloading files, browsing web sites, video playback and multi-channel audio mixing, you can develop anything you can think of.The new Lua 5.1 programming language scripting engine opens up limitless possibilities. With full syntax highlighting, code completion, functions and control structures, it's an exceptionally flexible system. It's the perfect software development tool for software developers, network administrators, programmers, consultants, ISV's or anyone creating software or doing software development for Windows. Major new version of AutoPlay Media Studio, Indigo Rose Software's multimedia software development tool. This visual software development tool helps software developers write professional software applications for Windows, including autorun CD/DVD/BLU-RAY's, database applications and autoplay menus. Convert DVD to PSP/MP4 (MPEG-4 video with AAC audio) video files to play on your PSP. Can Open DVD ,IFO, MPG/VOB files, split large video/audio files to volumes ,preview video stream and monitor converting process. WinXMedia AVI/WMV 3GP Converter is a powerful and easy-to-use 3GP/3G2 video converter. With it, you can convert AVI(DivX, XviD, MPEG-4, YUV...), MPEG1 MPEG2 WMV ASF video to 3GP/3G2 video files and play them in your 3GP/3GP mobile phone. Copy songs/videos/photos from ipod to computer. Flash 3GP Converter is a powerful and handy video converter for Mobile phone, Apple iPOD and PSP device . It can convert almost all video format, e.g. DVD (vob),DivX, XviD, AVI, WMV, MPG, MPEG, ASF, RM, MOV, ASX,Flash (flv)to 3gp,mp4,flv,swf. X360 Tiff to Pdf Image converter help you to convert TIFF Group Images into a PDF document. It supports Compressed, Group3, Group4, PackBits, Run Length Encoded, Color, Gray scale, 8 bit, 16 bit, 32 bit, and many more Tiff image formats.